The E-XP2 was the world’s most popular plural-component spray machine. Thousands of these electric powered pumps with heated hoses and Fusion-AP guns were sold but as of early 2014 they have been superseded by the completely redesigned and improved Reactor 2 E-XP2. Liquimix has used E-XP2 units for sale with warranty. Graco Reactor E-XP2 proportioner is engineered to process and spray polyurea and other coatings that require high pressures. The hybrid heaters and heated hose condition the materials to the right viscosity prior to mixing. Quick knockdown lower pumps for easy maintenance, easy-to-use controls, and rugged, portable design make the Reactor the preferred choice for coatings applications. 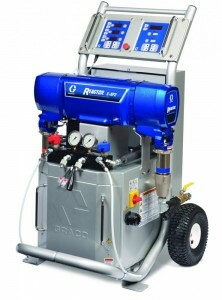 Count on Graco Reactor E-Series proportioners for power, performance and productivity on fast-curing polyurea coatings. And get the job done faster and more reliably than ever before.